As a newlywed, I know the importance of needing to get a good deal on furniture. Luckily, my husband and I were able to get most of our stuff for free from family and friends. However, we did have to pay for a few things. Our favorite piece in our home is our T.V. console in our living room. This beauty is literally one of a kind! We found a hideous beat up dresser on the side of the road months ago and thought maybe we can do something with this? One man’s trash is another man’s treasure, right? When I found out about Shabby Green Designs, I immediately fell in love. Michael and Autumn Miller have turned a fun hobby into a booming business. They take old pieces of furniture and bring them back to life. “It’s a privilege to be the ones to breathe new life into something once unloved and discarded.” When I asked Autumn why she started this business, her answer moved me. This is our beautiful T.V. console that Michael and Autumn refurbished for us. If you’re currently searching for furniture for your home, I highly recommend Shabby Green Designs. 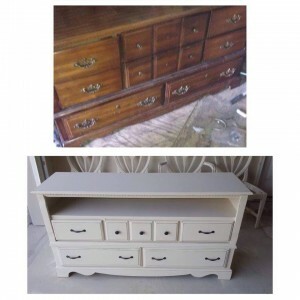 Not only will you likely save money, but you will have a unique custom-made piece of furniture. Additionally, you will be investing in people within our local community and helping their business continue to thrive. It’s a win-win! Find Shabby Green Designs on their website http://www.shabbygreendesigns.com/, or at their Facebook page https://www.facebook.com/ShabbyGreenDesigns. Incredible, accurate article about creative , incredible artists with an eye for detail coupled with a vision for extending the life of beautiful & not/so/ beautiful pieces of furniture .